Delaware Area Career Center students Tyler Brown, Jordan Cash, and Jacob Rufener hold the bookshelf they created that won first place at a recent SkillsUSA competition. The team said it had to design, blueprint, then create the bookshelf in about a month for the competition. From left to right: William Henderson, Cameron Mattox, Nathan Clark, Jacob Saldarriaga, Jordan Cash, Tyler Brown, and Jacob Rufener pose for a photo Friday at the DACC North Campus. Henderson, Mattox, Clark, and Saldarriaga are auto collision students who are currently working on a SkillsUSA Chapter display project to repaint a metal wheel that was created by the students in the welding lab. Four juniors from the Delaware Area Career Center were recently awarded scholarships after they competed in a SkillsUSA competition. 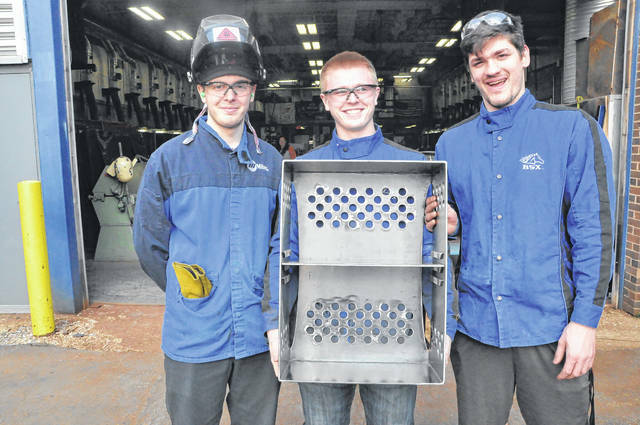 Welding students Tyler Brown, Jordan Cash, and Jacob Rufener competed in the Regional SkillsUSA Welding Fabrication Competition and were given a month to design, blueprint, and create a bookshelf. “You had to get the design down, you had to lay everything out on a piece of metal, and you had to have documentation of all of us cutting it, putting it together and laying it out,” Cash, the lone senior in the group, said. Cash said the team had to take a written test about their skills, knowledge and the lab, and then had to do an interview with the judges. Cash added his team went up against seven other teams and took home gold. Cash said the team learned new skills including how to use a CNC Plasma Table during the project. Rufener, Cash’s teammate, is deaf and uses a translator in class. Brown said during the project, they learned to overcome the communication barrier and function as one. “We kind of know how to talk to him without using signs now,” Brown said. DACC Welding Instructor Bradley DeMent praised the students and said he believed they worked well as a team. DeMent said he really enjoys the SkillsUSA competition because it brings out the best in his students. The gold award in the competition also came with a $5,000 scholarship. The students said they are looking forward to the regional competition on April 24 and 25. Additionally, DACC auto collision student Cameron Mattox entered a SkillsUSA competition in an individual collision repair category and won third place, taking home a $2,500 scholarship. Mattox said he had to take a fender, prep it and blend paint, and then clear coat it. Mattox added he also had to take an ASE test. Three of Mattox’s classmates were working with Mattox on a chapter display project for another SkillsUSA competition while he was working on the fender project. He said working on both projects was a good experience because they could bounce ideas back and forth. https://www.delgazette.com/wp-content/uploads/sites/40/2018/04/web1_DSC_1469.jpgDelaware Area Career Center students Tyler Brown, Jordan Cash, and Jacob Rufener hold the bookshelf they created that won first place at a recent SkillsUSA competition. The team said it had to design, blueprint, then create the bookshelf in about a month for the competition. 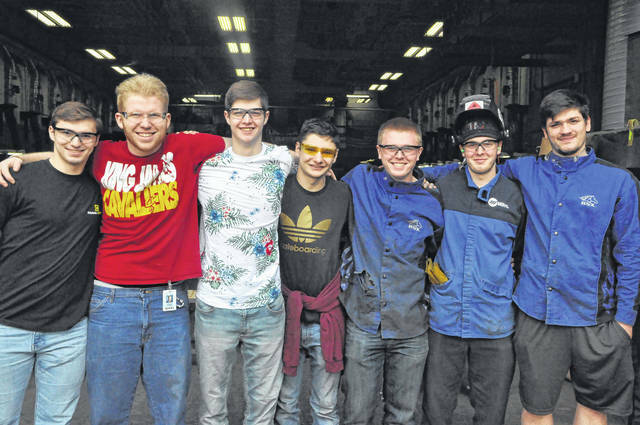 https://www.delgazette.com/wp-content/uploads/sites/40/2018/04/web1_DSC_1464.jpgFrom left to right: William Henderson, Cameron Mattox, Nathan Clark, Jacob Saldarriaga, Jordan Cash, Tyler Brown, and Jacob Rufener pose for a photo Friday at the DACC North Campus. Henderson, Mattox, Clark, and Saldarriaga are auto collision students who are currently working on a SkillsUSA Chapter display project to repaint a metal wheel that was created by the students in the welding lab.